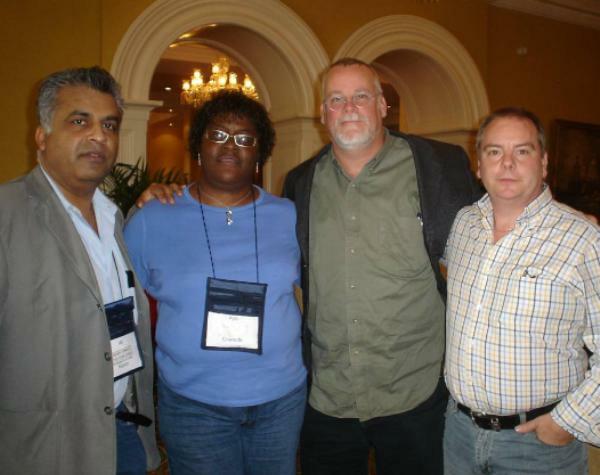 The Shots team of Mike Stotter, Ali Karim and Ayo Onatade met up with one of today’s greatest writers of crime fiction at the 2009 Crimefest conference in Bristol – Michael Connelly. We’d all been energised by the return of journalist Jack McEvoy in Connelly’s terrifying The Scarecrow and wanted to ask him a few questions. Mike Connelly is no stranger to Shots Ezine having talked to us in the past about City of Bones in 2002, The Narrows in 2004 and The Overlook in 2007. 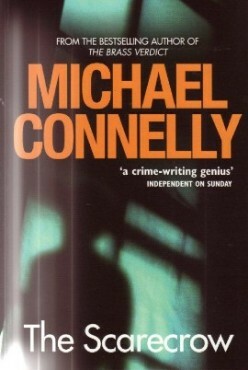 Apart from his ongoing Harry Bosch series, Connelly writes tremendous standalones, and this year’s The Scarecrow features Jack McEvoy who last showed up in Connelly’s breakthrough novel The Poet, battling the serial killer who gave the novel its name. This time McEvoy has to face off a very sick adversary named the Scarecrow, and like the Poet, this killer is using new technology, specifically crawling along the damp dark floor of the internet to extract mayhem and terror. Connelly mines the economic damage occurring in print media today at the opening of The Scarecrow, which is of little surprise considering he was a former high profile journalist covering the LA crime-beat just like his protagonist Jack McEvoy. Following the hunt for the Poet, Connelly’s alter-ego McEvoy got fame with a book deal and a plum job at the LA Times, but life has not been easy on him. Following a divorce and the recent downsizing at his newspaper, he finds himself training a young reporter and in the process stumbles upon a crime that will lead him to battle a serial killer called the Scarecrow. In The Poet, the internet was in its infancy but now it is well advanced and the Scarecrow is using its dark side to terrible effect. With bodies turning up wrapped in plastic sheets in the trunks of cars, Jack has his work cut out, especially as the Scarecrow knows a lot about Jack. The interesting analogy is that the internet is key to the novel’s plot as not only is it being used by a serial killer, but it is also responsible for the death of news-print media. Though at the climax there is balance, as the internet is also portrayed as a force for good in this changing world as Jack embraces the technology. It was a comfort to see FBI agent Rachel Walling reappear, making the dark world Connelly portrays a tad lighter. Considering Connelly varies his writing between police procedurals, non-fiction, short stories and courtroom thrillers, it is little surprise that he has entered the techno-thriller territory with his twentieth novel: The Scarecrow. So as Michael Connelly generously ordered us some sandwiches and beers, the tape machine is switched on and the Shots team got ready to grill him about what’s new in his world and that of The Scarecrow. 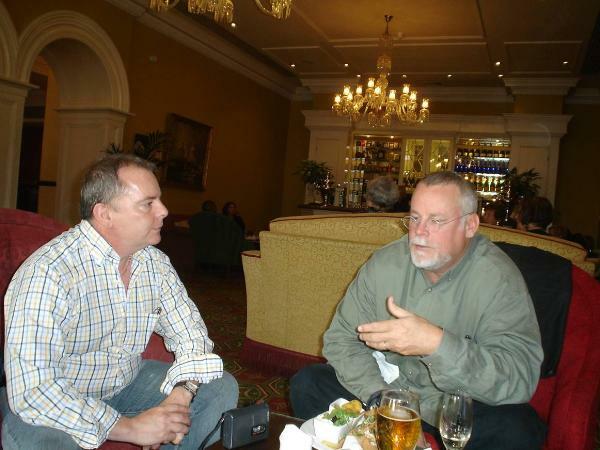 Shots You’ve been rather busy of late – apart from Crimefest Bristol, I heard you’re coming to Bouchercon Indianapolis, so after so many years in the genre how do you feel about the non-writing activity such as conventions and book promotion work? MC Well, I enjoy them when I get to them, but I have to keep in mind that my purpose is to write the books, so I would say in the last four to five years I have become more choosy with which events I go to. In fact, I went through a period when I wouldn’t go to any events, but now I’m coming out of that and I’m attending quite a few conventions. I missed the camaraderie of meeting journalists like you guys who cover the genre, other writers and fans of the genre. There is also the issue with spending time with my family as it’s been six or seven years since I moved away from Los Angeles to Florida where I’m from as is my wife; but as my books are set in LA, I have to go back and forth to California to research the books. This adds time to my work, so before I’d go practically to any convention now I have to be far more selective. A lot has to do with matching schedules. This tour I’m hitting Belfast, Bristol, Norwich and then Bouchercon in Indianapolis. I’ve had to give up some very choice parties. I really wish I could have gone to Bouchercon in Baltimore last year. I can’t remember what came up as I couldn’t just swing going up for a day, which a lot of people did to see Laura [Lippman] in her hometown. I wish I could have swung it. We heard you were sold out at Dave Torran’s No Alibis in Belfast, how’d that go? It was depressingly bad…[laughing]…..it was in fact probably the greatest event I’ve had in my career. There were more people there than I have ever seen in a bookstore. It was lucky that they had the lights down so I couldn’t see them all. When the lights came on, I was stunned at how many people turned up. It was my first time in Belfast, and I really enjoyed meeting everyone, and Dave Torrans runs a great bookstore. As a former journalist, what are your thoughts about the current state of newspapers and print media in this economic downturn? That’s what’s really depressing, I have been nostalgically connected to journalism though not been actively involved for the last fifteen years. In fact this issue is really the backdrop to The Scarecrow as I wanted to write about it. You called it an economic downturn, I hate to say it but it might actually be a death spiral. Newspapers are dropping like flies all across the US. I used to believe that it was a decline that would plateau, but now I’m not so sure. And is that why you brought back your journalist alter-ego Jack McEvoy in The Scarecrow? Exactly. I thought that when I was done with The Poet, I was done with Jack, as I was no longer a journalist. I had quit a year before I wrote The Poet, but I didn’t consider what would eventually happen to the business. In a recent article by David Simon, he said that the fall of the print media may cause huge problems to our society as it is the journalists that police the politicians and people in power. Do you agree with his concerns? Absolutely. ‘Corruption is a character’ says McEvoy in The Scarecrow, and it’s going to be the growth market as the journalist watchdogs die out. You just have to look at the expenses scandal in the UK to see that it was the newspapers that exposed that scandal. It’s the journalists that generate the changes needed to stop corruption. Okay, bloggers and news websites may be replacing some of the jobs that the journalists do, but when it’s a screaming headline on a newsstand, everyone can read it, whereas if it’s a blogpost or a website feature, will it get the public’s attention as well as a newspaper story? I don’t know the future of the media as a watchdog; it’s a worry indeed, as David Simon says. The Scarecrow is one of the creepiest of your books. As a family man, how do you manage travelling into the dark places that your work takes you? Are you easy to live with? Well, although I work from home, I work at one side of the house by the garage, so when I’m done I pretty much leave that stuff behind, close the door, so hopefully all the creepiness stays there. Writing about bad guys is always very easy, there’s no limits, no rules on them. In fact it’s much harder to write about the good guys. We heard that you were approached by Pelecanos and Simon to write for The Wire – can you tell us what happened and your thoughts on The Wire as a TV series? Yes, that was true – unfortunately I had a contractual obligation for another TV network that I owe a pilot to, and so I can’t write for television until I fulfil that obligation. The Scarecrow was largely inspired by the last season of The Wire. It got me off the couch. I was a police reporter just like David Simon. 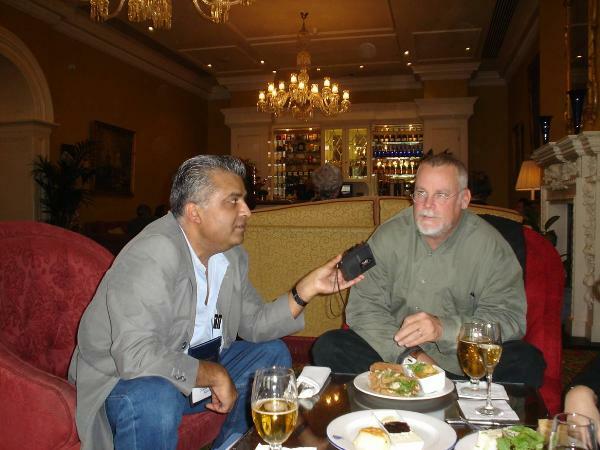 How do you find alternating with Bosch, McEvoy, Walling, Terry McCaleb, the legal thrillers with Mickey Haller, and your non-fiction / journalism and how do you manage such a prolific output? Then there’s the short story collections that I write introductions for and those are pretty easy also to slip into publication…I always say, I write at the pace I’m comfortable with; remember I come from a newspaper background where I’d be writing, re-writing, editing and working all day for different editions so I’m used to writing hard. In fact I’d often have to update, re-write the same story for new editions, even when there was scant new information. That discipline instilled a good work ethic in me. No publishers ever pressure me like that, so they don’t tie me down with wanting two books a year, or another one immediately after I deliver one, the pressure comes from me. I told my publishers last year that I would probably have two books this year and I’m pleased that The Scarecrow has done so well. The Scarecrow is a very fast read, so was it as fast to write? Yes, there was a lot of momentum in the writing and that I guess gives it a lot of momentum in the reading. Also as the main character is a journalist, and I’m a journalist so there was no step-back for me like ‘I wonder what Harry Bosch would do here’ kind of thing. I wrote what I would do in Jack McEvoy’s shoes. Ten years ago I would never admit that I wrote a book quickly because people would equate fast writing with a lack of quality, but now with over twenty novels under my belt, I reckon a fast book to write is a good book, due to momentum. Early on my career I would have been worried about writing so fast but now I don’t. Have you any plans to collect your own short stories into a collected volume? I think you’re overstating my skills as a short story writer – I haven’t won any awards. Really? No one told me…[laughing]….Seriously I do have some short stories so perhaps if I have to take a year out, or whatever, at least I could release a collection of my short stories. Only about half of my short stories are Harry Bosch tales, and I would like to publish a collection of Harry Bosch stories, so I guess I’ll have to write a few more to make a decent sized collection – I don’t have enough yet. Your website www.michaelconnelly.com has many special features with additional and bonus material for your work. How important is your web presence? Well, it’s Jane Davis that I need to thank as she lets me do what I do which is write. She does the creative stuff on the website and she’s good at that. She does suggest things that I write specifically for the website; recently I did a three part movie and I had to write the script for the movie which I handed to Jane and the film makers who then took over, so it was not too intrusive on my time. What additional material from The Scarecrow have you online? We’re always looking for something new; we’ve done extra chapters, we done ‘cut’ chapters, I’ve done short stories. This time we decided to do something visual. In The Scarecrow we have Rachel Walling returning but she doesn’t appear till much later on in the book, which is unusual for a main character. When I was writing it, I just couldn’t think of a way of bringing her in any earlier. Jane asked me, what has Rachel been doing prior to arriving after 140 or so pages? So I wrote a short story, which I turned into a script and that’s the three part movie – it has nothing to do with The Scarecrow, but deals with what she was doing before Jack called her for help. It sort of cuts across the narrative, though there are no spoilers to the book, in fact the film ends with her getting Jack’s call for help. Bosch has to be getting on a bit, so are we going to get any prequels when he was much younger or back to his war time tunnel rat adventures? That’s back with the short story collection, but I’m actually working on a new Harry Bosch novel now, which should be out in October and has a big seed planted about Bosch’s younger days. I guess a young Harry Bosch tale will be about four years or so away, when he’s too old to carry a badge. Has Jane Davis asked you to go on Twitter yet? Jane doesn’t like Twitter, but my US publisher Shannon Byrne twitters on several accounts. I’ve been watching the Harlan Coben Twitter thing and I’m not sure it’s for me. Harlan (like us all) has a love / hate relationship with Twitter – but it does seem to be very popular and a good way of getting information out fast. He does seem to like to tell people he’s going to the Rangers’ game. I’m not sure I need to know that. No one needs to know that about me either, and Twitter killed the newspapers so I’m not for it. Any news on the rumoured film projects of Lincoln Lawyer, and other film news? I never believe anything until I see it on the screen, but recently it was reported that Mathew McConahey signed to be Mickey Haller. But there were rumours that Al Pacino was going to star in Void Moon, so I always take these rumours with a grain of salt until I see it on the screen. You came up with a term ‘a velvet coffin’ – can you tell us where that came from? I know I’m a creative guy but I didn’t come up with that phrase – it refers to what people said working for the LA Times is like, ie a swell place to work until you die. In fact in 1987 when I left my regional newspaper to move to the LA Times, they told me ‘great, you’re moving to the Velvet Coffin’ – that was the first time I heard it, and when I worked there it was the nickname for working there, but it’s not like that any more. That reminds me – you mentioned earlier about the extra material – well, throughout the novel are twelve website addresses like Iron Maiden, Velvet Coffin etc and these are real and you can go to them and inside each is extra material – one shows all the covers for The Scarecrow that were considered, one is a summary and information on the next book. All Jane Davis’ work. Any more Jack McEvoy books? Thanks for yours and your support over the years at Shots.